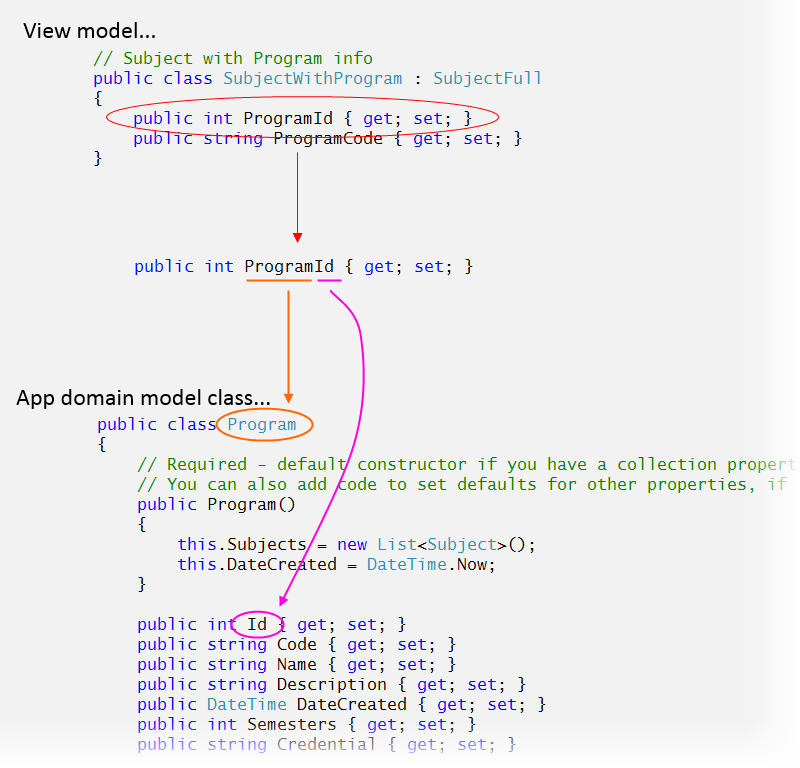 Working with your classes in an Entity Framework environment. AutoMapper and associated objects. Data annotations. Quiz. Near the end of the class/session, we’ll have a quiz. Use the AssocationsIntro code example to help you learn the topics in this section. The AssociationsIntroSolutions code example includes solutions to these topics. The following information will help you when working in an Entity Framework (EF) environment. The data context is the gateway from your app to your database server. Its data type is DbContext. It is the object that your app’s code uses when working with the persistent store. As you know, you must create a class that inherits from DbContext. 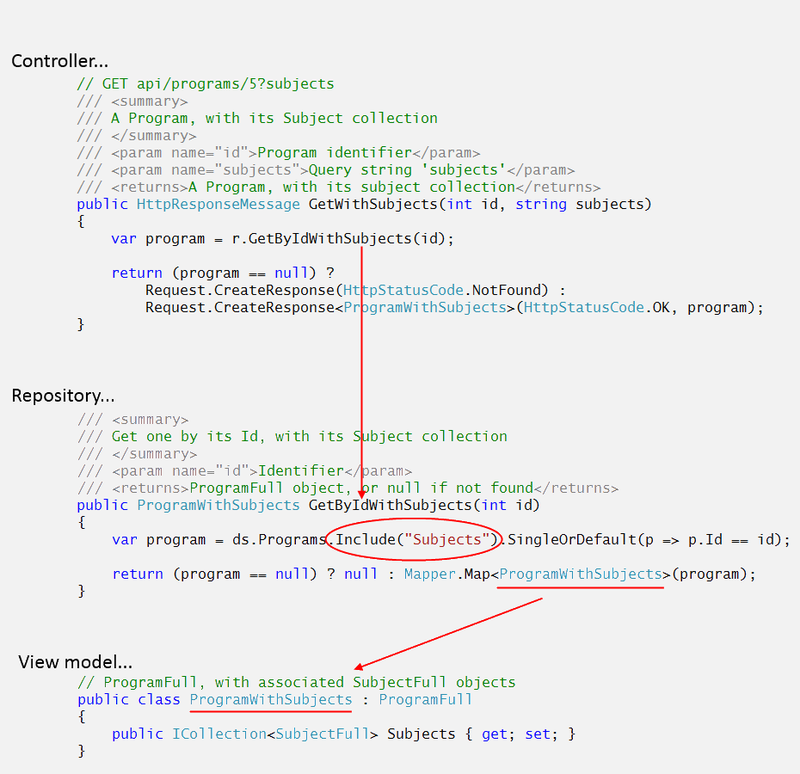 In that class, you write a constructor, and include properties for each data model class collection. The data type of the properties is DbSet<TEntity>, where TEntity is the name of one of your model classes. Assume that our app domain data model covers administrative objects in the School of ICT. For example Program, Subject, Employee, Semester, Course. As noted earlier, the data type of programs is DbSet<TEntity>, specifically DbSet<Program>. When you are ready to return the collection, you MUST transform it into a collection that’s based on a view model class. In the past, you used the SingleOrDefault() method to fetch a single matching object from the persistent store. You can continue to use that. A successful SingleOrDefault expects to return exactly one object. An unsuccessful SingleOrDefault will return null. This is the behaviour we want, when we are working with a (primary key) identifier. In our code, we simply need to do one check/test – “if null” – to determine how to use the result. In contrast, FirstOrDefault is used when the data source contains zero or more matching objects (that meet the fetch condition). If successful, it returns the first object found. If unsuccessful, null is returned. As a result, you would have to perform two checks/tests – number of objects, and null state. First or Single should not be used, when following our coding standards. If First or Single is unsuccessful, the statement it appears in will raise an exception. In other words, it will not assign null as the return value, as with the related methods FirstOrDefault or SingleOrDefault. Reminder: “c” is the range variable. It represents an object in the Programs collection. Its type is Program. The letter “c” does not have any special significance. Like other variables, its name is meaningful to you only. Choose your own name. It can be one or more characters in length. The OrderBy extension method is defined in the Queryable class (look at the inheritance and implementation list above). This method can be used on any object of type IQueryable<TEntity>. Its return type is IOrderedQueryable<T>. The range variable – prog – represents an object in the Programs collection. Its type is Program. AutoMapper is a convention-based mapper. Between classes, it will map/convert properties that have the same name and type. 2. Add an AutoMapper map to Global.asax.cs, which maps the design model class to the new view model class that you created in step 1 above. 3. In the manager/repository, when the code fetches the object, add the Include() extension method to fetch its associated object. 4. In the controller, add a method that will call the manager/repository method. You can see more in the AssociationsIntroSolutions code example. Look in the Subject_vm.cs source code file, and notice the composite-named properties from the Program class. You can see more in the AssociationsIntroSolutions code example. Look in the Subject_vm.cs source code file, and notice the SubjectBaseWithProgram class, which includes a ProgramBase property. 3. In the manager/repository, when the code fetches the object, add the Include() extension method to fetch its associated collection. You can see more in the AssociationsIntroSolutions code example. Look in the Program_vm.cs source code file, and notice the ProgramBaseWithSubjects class, which includes a IEnumerable<SubjectBase> collection property. You can skim the section titled “CUSTOM VALIDATION LOGIC”. Some data annotations are intended only for design model classes, while others are for use with view model classes. And, some work with both. We will build some examples in class. Note: The Google Chrome browser do a good job of rendering the <input> fields. Some IE and Firefox versions do not offer the same support, unless you use a polyfill.